Selecting an operating system for your IT infrastructure has long-term consequences. The amount of change in a number of Oracle’s products, coupled with their higher expense, is leading many enterprises to investigate alternative platforms for their enterprise IT workloads. But where can you look for a more cost-effective and flexible substitute? 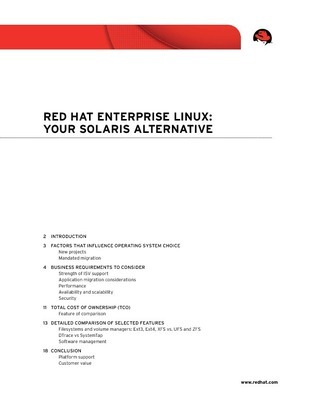 Migrating to Red Hat Enterprise Linux opens up the widest possible choice of platforms. With Red Hat, you have the freedom to choose just about any hardware platform. Check out this informative paper to learn more about the benefits like openness, performance, availability, flexibility and reduced TCO that come with this solution.